Bali Traditional Tour Trena Jenggala is very popular dance group in Ubud. 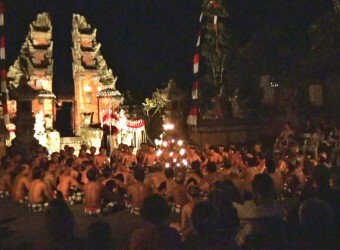 They perform Kecak dance wich dynamic and mysterious dance. Those dance has no musical accompaniment like many other Indonesian dances do. The 50 man chorus arrange themselves in a ring around a flame, to produce a stage and make the chanting noise 'Ke chak- Ke chak'.